PS DOORS will announce its new SafeMezz360™ mezzanine safety gate at MODEX 2016. This innovative new gate keeps workers safe during the important but potentially hazardous job of loading and unloading forklifted materials to and from a mezzanine. SafeMezz360 is both ANSI- and OSHA-compliant. SafeMezz360 is an ANSI- and OSHA-compliant fall protection product that creates a foolproof, fully enclosed area that keeps workers safe from the elevated mezzanine edge. PS DOORS will be in booth #1450 at MODEX 2016 on April 4-7 in Atlanta, Georgia. Part of PS DOORS' Safety Access™ line of products, the SafeMezz360 meets ANSI standards, including the stringent ANSI MH28.3 Section 6.4.3 requirement that states: "A work platform shall be designed such that the elevated surface is protected by the guards at all times. Gates that swing open, slide open or lift out, leaving an unprotected opening in the guarding, are not acceptable." The SafeMezz360 also includes an ANSI-required 4-inch safety toeboard and meets OSHA safety railing standards. 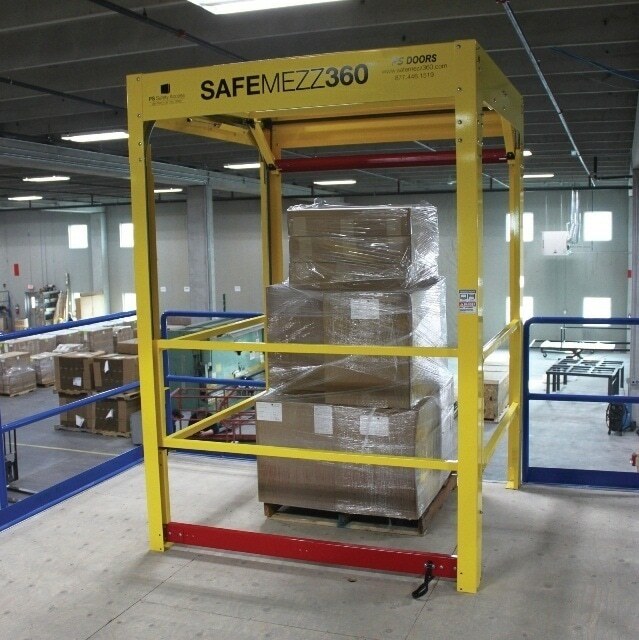 The SafeMezz360 utilizes a counterbalanced gate system to provide 360 degrees of mezzanine ledge protection. In addition, it features a slam-proof, cushioned dampening system that protects personnel from dangerous and noisy slamming. The SafeMezz360's gate opens and closes smoothly on 2-inch nylon rollers and track system, allowing easy, one-handed operation. It's constructed with heavy-gauge steel with a durable powder coat, safety yellow finish that's ideal for repetitive use. It bolts easily into place on the mezzanine and is available in single- or double-pallet widths. "Our SafeMezz360 is an economical way to meet both ANSI and OSHA standards, making a hazardous job a lot safer," says Dean Thorsen, PS Safety Access national sales manager. "The SafeMezz360 is the all-angles way to protect your team on the mezzanine."